A healthy, flavourful meal that takes just minutes to make! The more I learn about Asian cuisine, the more impressed I am by what a flavour party so many dishes are. This meal is a great case in point. Before we move on to the recipe, I’m going to share a little secret: this dish was inspired by something I saw on a recent episode of Queer Eye. I don’t watch much television, preferring books to screens in my leisure time, but that show is one of my guilty pleasures. Larb (in Lao: ລາບ) – a seasoned meat salad typically served in lettuce leaf cups – is often called the unofficial national dish of Laos and has counterparts in many other cuisines including those of Thailand, Myanmar and the Yunnan region of China. It’s simple, flavourful and so satisfying. 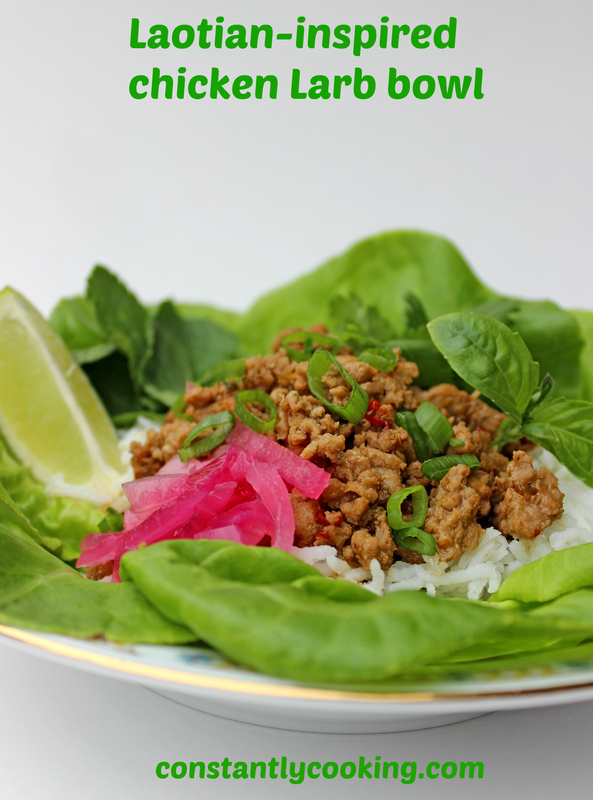 We tried this dish two ways – in lettuce cups and in bowl format – and decided we preferred the bowls because they were a lot less messy to eat. Note that you can definitely cook the meat ahead of time and refrigerate or freeze it then reheat at serving time. Place the sliced red onion in a broad shallow dish. Heat the vinegar in the microwave or a small saucepan and pour over the onion. Toss the mixture with two forks and set aside to pickle the onions, tossing again every 5 minutes or so. Add the oil to a large, broad saucepan placed over medium heat. Let warm for a few minutes then add the ground chicken. Stir to break up clumps and cook, stirring often, until chicken is no longer pink. Add garlic, green onion, sliced chilies and black pepper to the ground chicken; stir to blend well and cook, stirring often, for 2 minutes. Add the soy sauce, fish sauce, sambal oelek and maple syrup; stir to blend well. Continue to cook uncovered, over medium heat, for about 5 minutes or until liquid is almost gone. While mixture finishes cooking, drain the pickled red onions and set out garnishes out so guests can assemble their own bowls. To serve, line 6 broad bowls with lettuce leaves. Place 1/3 cup hot cooked rice (if using) in the centre of each bowl and top with cooked meat. Invite guests to squeeze fresh lime over top and add pickled onions, herbs and additional sambal oelek if desired. 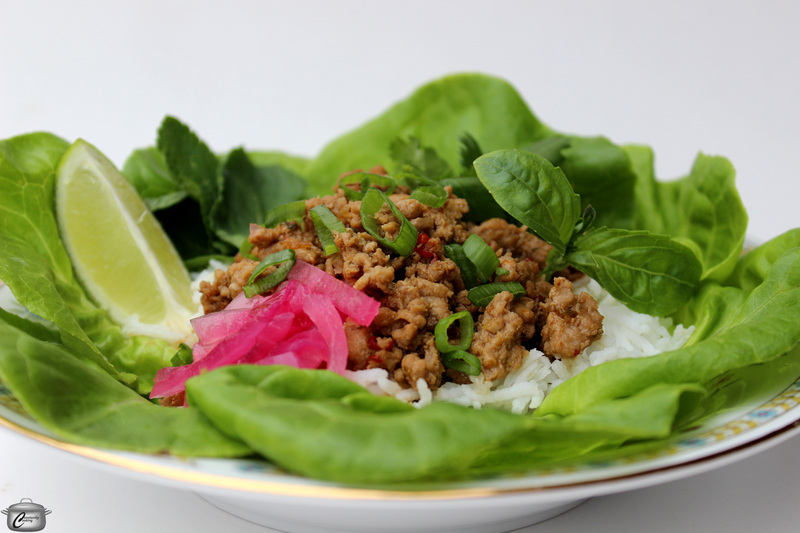 This entry was posted in Chicken, dinner and tagged Asian food, Bibb lettuce, bowl, delicious, fresh herbs, Lao, Laos, Laotian, Laotian food, Larb, lettuce, lettuce cups, make-ahead, Paula Roy, Queer Eye recipes, rice, spicy, what to make with ground chicken. Bookmark the permalink.